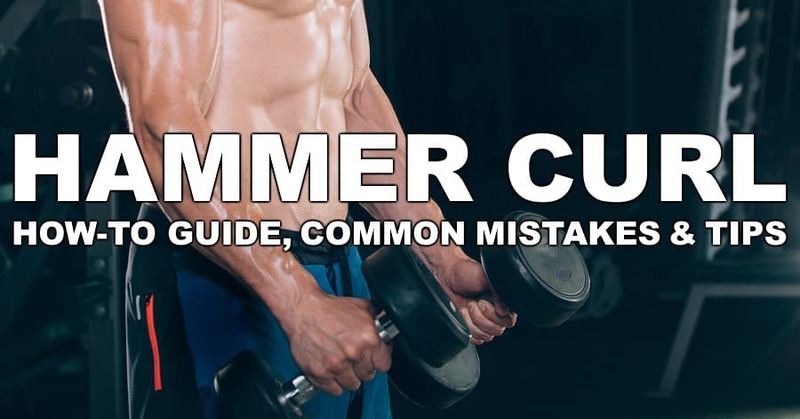 Is the Hammer Curl Right for You? Make sure both arms are completely straight and extended. Starting position - front view: Note the neutral posture with the core braced. Starting position - side view: Note how the elbows are ever so slightly bent. Also the elbows are shifted a bit more forward than they would be if the arms were totally relaxed. They are basically in line with the hips. Ideally, the elbows should never go any further back than this at any point throughout the lift. Forcefully flex the elbow to raise the dumbbells. Keep the elbows pinned into your sides and try to to flex/swing at the shoulder. Note that it's okay to shift your elbows forward slightly when curling the weight to the top of the rep. But not too far foward, as that will take tension off the biceps/brachioradialis and put it on the front delt. Once you have reached maximal flexion in the elbow, actively and deliberately squeeze the biceps for a brief pause. Squeeze hard at the top! You should feel all the tension on your biceps/brachioradialis at this point. If these muscles have less tension on them than during the actual curling motion, chances are you shifted the tension onto your shoulder by bringing your elbows too far forward. Once the dumbbells achieved a motionless position, reverse by deliberately extending the elbow. Put conscious effort into resisting the pull of gravity and slowly bring the weights back to the starting position. Lower the weight by extending your elbow until your arms are straight, but just short of a full lockout. Feel the biceps and brachioradialis working extra hard as you deliberately resist the dumbbells on the eccentric motion. Once the dumbbells are motionless at the start position, repeat the movement. If you can’t initiate elbow flexion without swinging the hips, you need to drop the weight and focus on just using the biceps to start the pull. Leaning back to “cradle” weight into the midpoint position is a sign of poor motor control of the biceps. Focus on gradually squeezing the bicep at the top of the movement and only bringing the weight up asd high as your elbow flexion allows. Deliberately resist the weight on the way back down without losing elbow position at your sides. Allowing the elbows to swing forwards or backwards and relaxing the muscle negates the eccentric benefits of the exercise. Make certain to return the dumbbells all the way to the starting point. Complete extension is key to maximize the effectiveness of the exercise. Don’t swing the elbows or shoulders to achieve a greater range of motion. Ensure complete extension of the elbows between reps. Squeeze the biceps hard into the mid-point to get the most active range of motion out of your elbow flexion. Resist the weight and the force of gravity when returning to the starting position to get the most benefit out of the eccentric portion of the exercise. Hammer Curls are an excellent exercise for any level of lifting experience. Especially those individuals pushing heavy weight pretty regularly, training the biceps from a neutral (palms facing each other) will create a welcome reprieve in shoulder torque that can be extremely with supinated/pronated straight bar curling. Also, hammer curls do an excellent job distributing the workload to all of the muscles responsible for elbow flexion. Hammer Curls should be a staple arm exercise in every training program.